Kathleen Day, experienced business journalist and professor, discusses her new book on the history of financial crises, Broken Bargain, and how the economy could once again take a sharp downturn without careful planning. 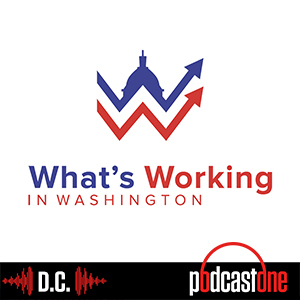 On this EXTRA Episode, Jason MIller, CEO of the Greater Washington Partnership, and Jill Klein, Dean of American University School of Professional and Extended Studies, discuss the Capital CoLab, a recent partnership between regional universities and the GWP to ensure students have the digital literacy that businesses in the area crave. Richard Levick, CEO of Levick; Phil Bond, president of government affairs for Potomac International Partners, and Elizabeth Rogers, regulatory expert and partner at Michael Best, discuss the myriad problems facing future regulations for the tech industry, and how regulations might take shape in the near future. On this EXTRA episode, we speak with Jack McDougle, President and CEO at Greater Washington Board of Trade, and Chuck Bean, Executive Director at Metropolitan Washington Council of Governments, about the recent innovations in 5G technology, and how these advancements can assist both the average person and the most dedicated entrepreneurs in the region. Vladimir Eidelman, VP of Research at FiscalNote, discusses how his company's applied AI lets lawmakers, lobbyists and laymen understand how likely various bills and policies are to pass, and help them know how exactly they'll be affected. Andrew Scobie, founder of Faraday Grid, discusses how America's electrical infrastructure has changed little in over a century, and how his company hopes to revolutionize the industry. Mark Chalfant, artistic and executive director at Washington Improv Theater, discusses how his nonprofit's WIT at Work initiative helps coworkers become better, and more empathetic, communicators. Rob Sobhani, sounder and CEO of Sparo, discusses how his company uses gamification techniques to drive people to donate to their favorite charities. John Cofrancesco, VP of Business Development at Active Navigation, discusses the security risks that can be hidden in everyday files like emails, spreadsheets and presentations, and how companies can work to mitigate damage these might cause in a hack. Esther Lee, CEO of innovation hub and nonprofit Refraction, discusses what her organization is doing to draw in more startups and talent to the D.C. region, and what the region as a whole can do to help tip the scales. On today's EXTRA episode, Dr. Brent Goldfarb and David Kirsch, both professors at the Robert H. Smith School of Business and co-authors of Bubbles and Crashes: the boom and bust of technological innovation, discuss the cyclical nature of the tech innovation environment. Other topics on deck include their recent book, what happens when an economy crashes, and how to salvage your business in troubling economic times.